The gelato storm long ago hit Maui. The gourmet chilled Italian treat is now popping up all over the island. 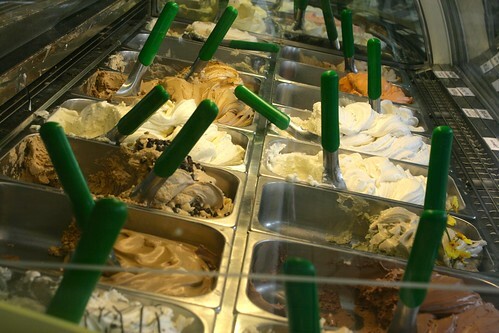 Ono Gelato has has become one of Maui’s best known brands, with stores in Paia, Lahaina and Kihei. The South Maui location is their newest store, set up by Mitch and Tehani Wendorff in Azeka Makai–in the former Maui Gelato location, in fact–next to Taco Bell. The Wendorffs own their store independently from the others, but serve the same recipes. Mitch is a teacher at Maui High, while Tehani runs the store and makes the gelato. I asked him why he went 25 years since consuming gelato. He told me that a quarter century ago he was in Rome, tried it there, and hasn’t gotten it since. Tehani quickly guided him to their most popular flavor–called “Sandy Beach,” it features peanut butter, graham cracker crumbs, coconut and a ribbon of chocolate. Second to that is their “Coffee Crunch,” which comes with chocolate chips and macadamia nuts. Soon another couple came in. Tehani asked if they would like to taste anything. “No, I know what I want already,” the man said, and ordered a Kula berry smoothie. His girlfriend went for a cone of Sorbetto, Ono Gelato’s vegan-friendly line of flavors that contain no dairy. He said the berry smoothie is his usual order, and that it’s divine every time. It has Kula strawberries, raspberries, bananas, cheesecake gelato and agave, and sells for $5.75. 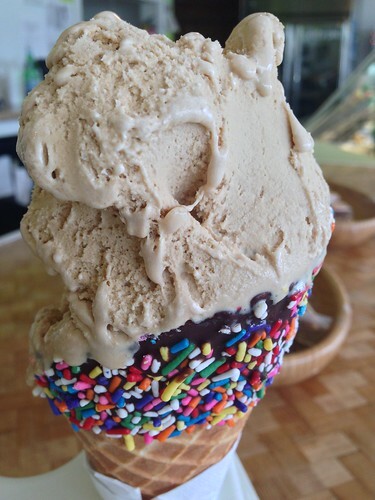 Gelato scoops start at $4.75, and house-made cones are 59 cents. The menu also features made-to-order Maui coffee and espressos, affogato in different flavors, fresh fruit-only smoothies, creamy smoothies, 16 flavors of gelato and seven sorbettos. Affogato is an espresso sundae–imagine scoops of gelato submerged in espresso, then topped with whipped cream and mac nuts or chocolate sauce. Wendorff says she gets local berries and lilikoi and any other ingredients she can get to keep it local. What’s more, Ono Gelato in Kihei has a nice temperature controlled room with big bench seats in which you can eat your gelato. Tehani said a lot of customers want to go outside to eat their cones, but she advises eating in because gelato will melt a lot faster than ice cream. It’s part of the recipe. Ono Gelato followers may recognize Tehani, as she used to manage at the Paia store. 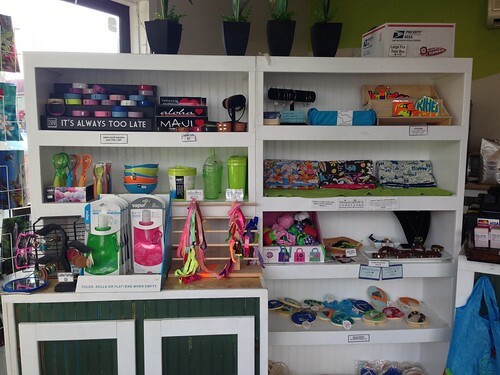 She says that when she had the opportunity to get this Kihei store, she had to jump on it. She also makes these scrumptious gelato cakes. She was working on a chocolate one while I was there. 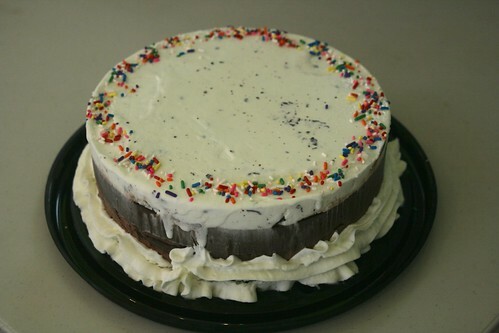 The chocolate cake served as a base before becoming smothered with layers of gelato and decorated with delicate sprinkles and whipped cream. The cakes are pre-ordered, and they need about three days notice before you’d like them. You can also order family size–a whopping two and a half liters of gelato for $36 (pre-ordering that size three days advance is advised). The dining room also serves as a made-in-Hawaii gift shop. Tehani has Hula Girl pancake mix, Jeff’s jams and jellies made in Makawao, Big Island Honey and hand-crafted blankets, jewelry, hats and bags. They offer a kama’aina discount of 10 percent off scoops and have a frequent buyer card–buy 10 gelatos and get a free medium. If you stop by on Mondays and Tuesdays, they offer a buy-one-pint, get-the-second-at-half-price deal. Pints are normally $7.95. I packed mine all the way to Makawao and it was amazingly resilient. It did melt a bit, but after some freezer time I was enjoying Ono Gelato Sandy Beach and dark chocolate sorbetto in the comfort of my own home.